The grand sweep of Monte Alban's central plaza is very impressive -- particularly when you consider that the Zapotecs built it without the benefit of the wheel or any beasts of burden! Photo by guide Dan Lane. Oaxaca City is quietly nestled in a dry intermontane valley in southwestern Mexico. It lies in the midst of thousands of years of human history and still-practiced artisan culture, and also lies at the epicenter of one of Mexico's regions of avian endemism -- and it has some unique culinary highlights as well. How's that for lucky?! We had a taste of the cultural background of the region: our driver Jorge's informative tours of the ruins were enjoyed by all, as was the demonstration of the traditional Zapotec rug weaving at Teotitlan. From Jorge, we learned that the Oaxaca valley is the site of one of the most significant events in the history of New World cultures: it is thought to be where corn (maize) was first cultivated! The Zapotec and Mixtec cultures have occupied the valley for nearly 4000 years, and the ruins of Monte Alban, Yagul, and Mitla speak volumes (and keep even more secrets) about their ways of life. Happily for us, these ruins also have habitat which is still home to some of the region's fascinating birds. 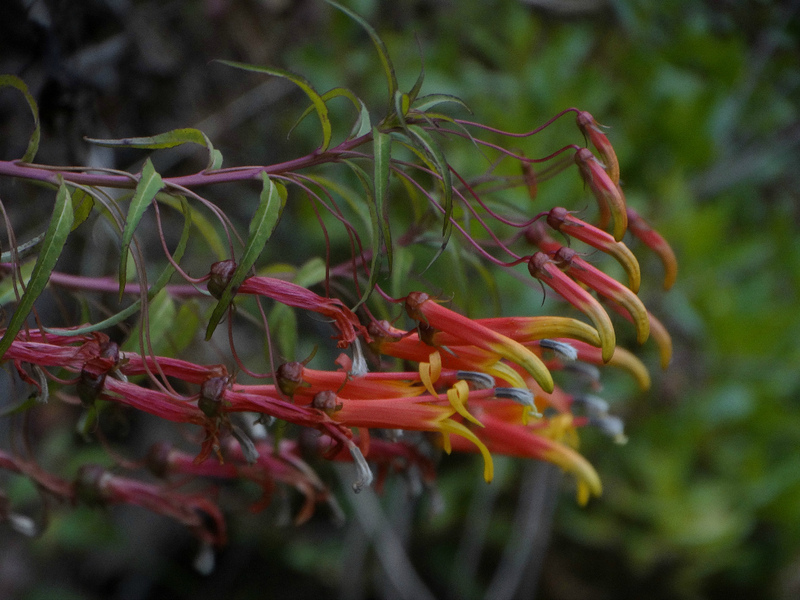 The isolated nature of the Oaxaca valley has resulted in high rates of endemism among many organisms there, and, of course, we particularly noted this with the birds! The rain shadow caused by the southern terminus of the Sierra Madre Oriental to the north of the valley results in the deciduous, downright arid, nature of the valley. 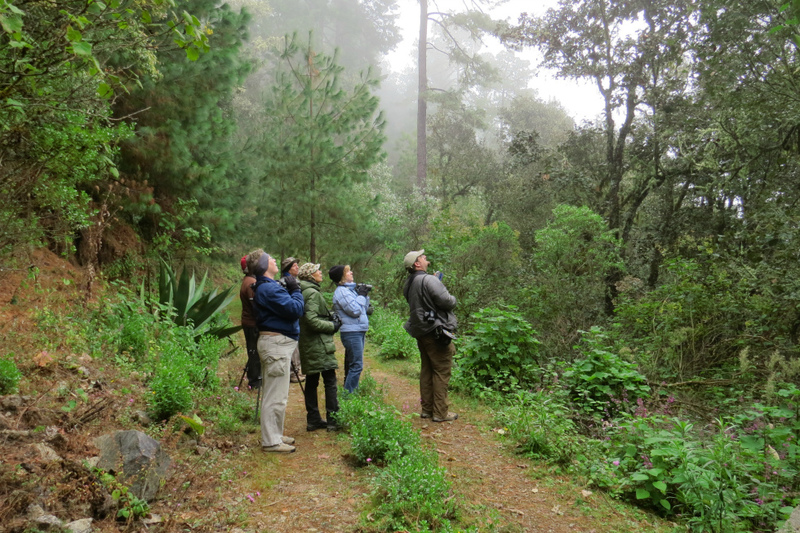 Separated from other such habitats by elevation and more humid pine-oak forests on the slopes surrounding it, the valley has several species that are unique, including Oaxaca and Bridled sparrows, Boucard’s Wren, Ocellated Thrasher, White-throated Towhee, Beautiful Hummingbird, and Gray-breasted Woodpecker. 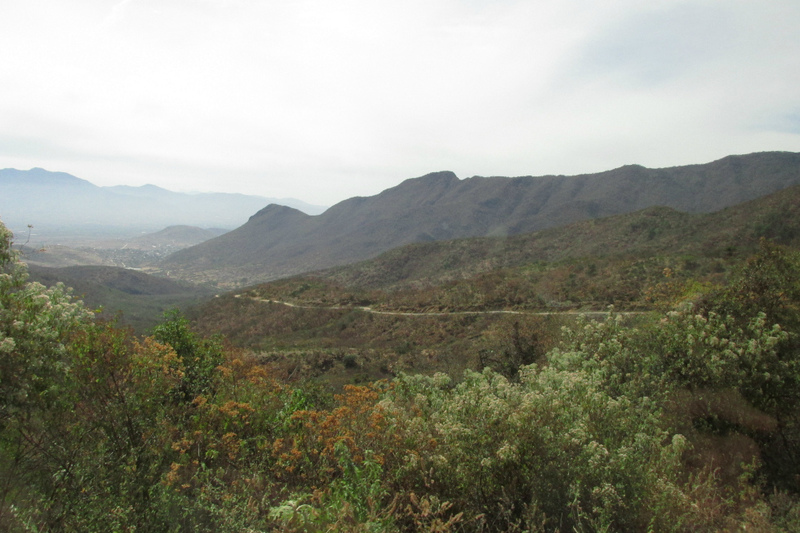 Other west Mexican dry-habitat endemics are also present, such as the three vireos (Slaty, Golden, and Dwarf), Dusky Hummingbird, and Blue Mockingbird. The pine-oak forest on the slopes above are home to other endemics, particularly the very local Dwarf Jay, but also Russet Nightingale-Thrush, Collared Towhee, Rufous-capped Brushfinch, White-striped Woodcreeper, and Red Warbler. There is no shortage of birds to enjoy here! Among our many good views were the pair of Fulvous Owls that caterwauled over us on Cerro San Felipe, the friendly Rufous-capped Warblers that were common in the deciduous scrub at most sites, the out-of-place Ovenbird that strutted around in front of us on the trail at Monte Alban, the striking Orange-breasted Bunting that gave us a fine show at Km 77, the bold Strong-billed Woodcreepers that put on a fine show in the pine-oak forest and the diminutive Dwarf Jays with which they traveled, the colorful Mountain Trogons that played coy with us, the lovely Crescent-chested (or was that “Chestnut-crested?”) Warblers that took part in the mixed flocks, or the subtly beautiful Slaty Vireo that showed off in front of us at Monte Alban. Other memories were the wonderful Oaxacan food we enjoyed, the tours of the archeological sites, and Monte Alban’s grandeur in particular… and, of course, that amazing experience with a Jaguarundi! I don't think anyone was prepared for such an experience with that cat! These were only some of the memories we took from our trip. I hope you enjoyed them as much as I did. I look forward to seeing you all again on another outing, sometime down the road. Meanwhile, good birding! 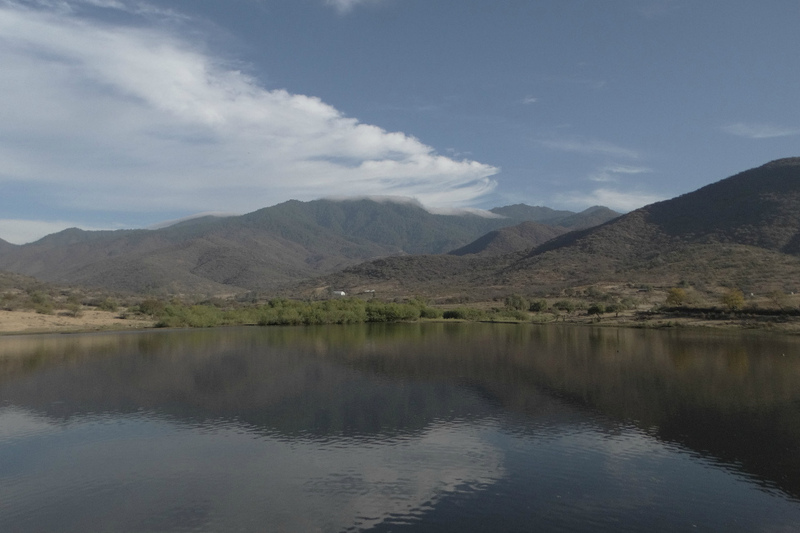 Presa Piedra Azul and the mountain beyond is a great place to be introduced to Oaxaca birding. Photo by guide Dan Lane. LEAST GREBE (Tachybaptus dominicus) – Many of this diminutive grebe on Piedra Azul. BROWN PELICAN (Pelecanus occidentalis) – Astonishing! This was one of the first birds we saw at Piedra Azul on our first visit... probably the first record for the Oaxaca valley! An annoyed Northern (Mountain) Pygmy-Owl is still pretty cute. Photo by participant Alan Abel. LITTLE BLUE HERON (Egretta caerulea) – Wayne spotted this species, a rare one in the Oaxaca valley. REDDISH EGRET (Egretta rufescens) – This is also a rare species for the Oaxaca valley, since it is typically a coastal species! The one we saw seemed to be a first winter bird and has been reported from the site since November. WHITE-TAILED KITE (Elanus leucurus) – Seen best at Monte Alban, but several were along the highway on the outskirts of Oaxaca city. HOOK-BILLED KITE (Chondrohierax uncinatus) – A bird flew past us on the entrance road to Yagul. This is not a common bird anywhere, so it was a great sighting! SHARP-SHINNED HAWK (Accipiter striatus) – Amy spotted our first individual at Monte Alban, another was seen the next day. COOPER'S HAWK (Accipiter cooperii) – Seen our first full day around Teotitlan. The scenic Yagul Valley has been home to humans for millenia; the earliest evidence for the domestication of corn (maize) was found in caves occupied pre-historically here. Photo by participant Alan Abel. SHORT-TAILED HAWK (Buteo brachyurus) – Seen on two days, first outside Mitla, and again near Santa Catarina de Ixtepeji. 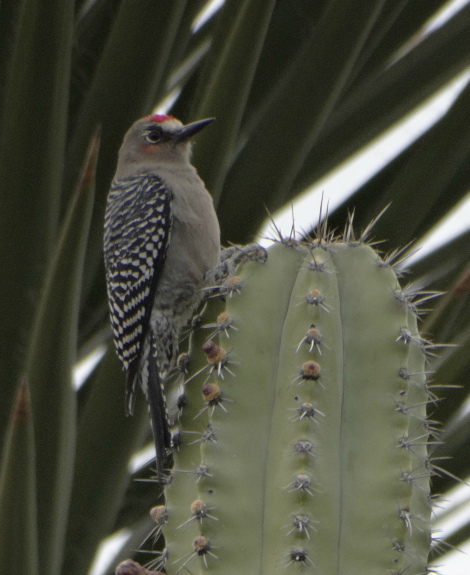 The handsome Gray-breasted Woodpecker is like a Gila Woodpecker wearing more makeup. Photo by guide Dan Lane. BAND-TAILED PIGEON (Patagioenas fasciata) – Brief views of small flocks flying over us in the pine-oak forest on three days. INCA DOVE (Columbina inca) – Misnamed... should have been "Aztec Dove". Oh well. COMMON GROUND-DOVE (Columbina passerina) – Quick views of birds at the Yagul entrance road. WHITE-WINGED DOVE (Zenaida asiatica) – One of the more common birds around the lower elevations. WHISKERED SCREECH-OWL (Megascops trichopsis) – A bird responded well in a more oak-dominated patch of forest on Cerro San Felipe. NORTHERN PYGMY-OWL (MOUNTAIN) (Glaucidium gnoma gnoma) – Fine views of a bird our first day above Teotitlan was nice. FERRUGINOUS PYGMY-OWL (Glaucidium brasilianum) – A bit unexpected was a bird that responded to tape of Colima Pygmy-Owl (!) at KM 77. FULVOUS OWL (Strix fulvescens) – After several years of uncertainty about which Strix owl was on Cerro San Felipe, we can now feel comfortable that Fulvous is there for certain. Mexican Barred Owls should be up there too, though! MEXICAN WHIP-POOR-WILL (Antrostomus arizonae) – After hearing a few and seeing one fly around us, a perched bird on Cerro San Felipe was a nice highlight of our night birding. GREEN VIOLETEAR (Colibri thalassinus) – Common and noisy at higher elevations. MAGNIFICENT HUMMINGBIRD (Eugenes fulgens) – A couple showed above Teotitlan, but birds on feeders at Restaurante Colibri were better. BLUE-THROATED HUMMINGBIRD (Lampornis clemenciae) – One of the many hummingbirds enjoying the Salvia bank at Rio Verde. It can be surprisingly chilly in the highlands. Witness the hats and gloves on many in the group -- definitely appreciated as we birded along Cabeza de Vaca trail! Photo by participant Alan Abel. BERYLLINE HUMMINGBIRD (Amazilia beryllina) – Perhaps easiest to see right around the hotel, but several were higher up at flower banks. GREEN-FRONTED HUMMINGBIRD (CINNAMON-SIDED) (Amazilia viridifrons wagneri) – Cheryl and I caught a brief glimpse of this species at the KM 77 site. WHITE-EARED HUMMINGBIRD (Hylocharis leucotis) – Perhaps one of the most numerous hummingbirds of the tour! MOUNTAIN TROGON (Trogon mexicanus) – After a couple of poor views our first day, we made up for them on subsequent days at Cerro San Felipe! Snazzy bird! RUSSET-CROWNED MOTMOT (Momotus mexicanus) – Talk about 11th hour! As we headed back to the van, one flew by and buried itself in the vegetation. It took a little patience, but we eventually found it and enjoyed walk-away views in the scope! That's how I like my motmots! 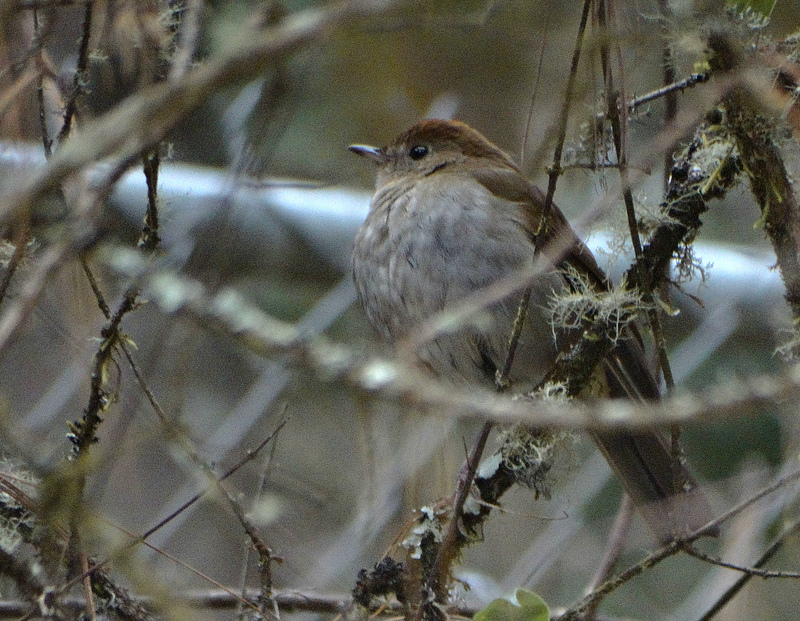 Another skulker that was extraordinarily view-able on this tour was Russet Nightingale-Thrush. Photo by guide Dan Lane. GREEN KINGFISHER (Chloroceryle americana) – A couple at Piedra Azul. ACORN WOODPECKER (Melanerpes formicivorus) – A pair or two were at Rio Verde. HAIRY WOODPECKER (SOUTH MEXICAN) (Picoides villosus jardinii) – Birds in the pine-oak forests here sound a bit more like Arizona Woodpeckers and have smoky underparts compared to northern birds. CRESTED CARACARA (Caracara cheriway) – Common in the valley. This lovely Lobelia is an important hummingbird food source. Photo by guide Dan Lane. STRONG-BILLED WOODCREEPER (CENTRAL AMERICAN) (Xiphocolaptes promeropirhynchus sclateri) – This population was almost unknown a decade ago, but now we can encounter them with some regularity (and saw at least three pairs our first day to Cerro San Felipe!). Their voice is quite unlike that of other populations of the species. Hmmmm. SPOT-CROWNED WOODCREEPER (Lepidocolaptes affinis affinis) – Common in jay flocks in the more humid pine-oak habitat on Cerro San Felipe. NORTHERN BEARDLESS-TYRANNULET (Camptostoma imberbe) – Mostly heard, but Wayne got us on one at Yagul. GREENISH ELAENIA (Myiopagis viridicata) – A vocal bird at Piedra Azul was upstaged by the Jaguarundi. TUFTED FLYCATCHER (Mitrephanes phaeocercus) – Cuter than cute! We really enjoyed these mini-pewees. 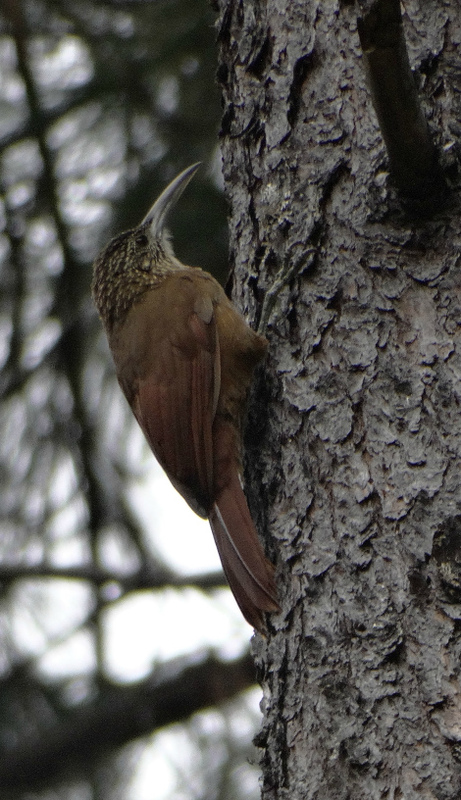 Now that we know the voice of this distinctive population of Strong-billed Woodcreeper, we find them with regularity on Cerro San Felipe. Photo by guide Dan Lane. GREATER PEWEE (Contopus pertinax) – A large pewee (as the name would suggest) we saw several times. Local name is "Jose Maria" for the vocalization. BLACK PHOEBE (Sayornis nigricans) – A pair at Piedra Azul. NUTTING'S FLYCATCHER (NUTTING'S) (Myiarchus nuttingi inquietus) – Similar to the last, we got to compare them nearly side-by-side at Yagul. GREAT KISKADEE (Pitangus sulphuratus) – Familiar from just about anywhere between Texas and Argentina... it's not common in the Oaxaca valley, but present at most lower sites. SOCIAL FLYCATCHER (SOCIAL) (Myiozetetes similis pallidiventris) – A pair showed well near Piedra Azul. TROPICAL KINGBIRD (Tyrannus melancholicus) – Easiest around the hotel. THICK-BILLED KINGBIRD (Tyrannus crassirostris) – Seen on several days at mid-elevations. ROSE-THROATED BECARD (Pachyramphus aglaiae) – Two or three were hanging around jay flocks at Cerro San Felipe. LOGGERHEAD SHRIKE (Lanius ludovicianus) – These are the southernmost shrikes in the Americas! PLUMBEOUS VIREO (Vireo plumbeus) – This and the next two species were in flocks on our last full day. HUTTON'S VIREO (Vireo huttoni) – The kinglet-like vireo of the pine-oak forest. CHESTNUT-SIDED SHRIKE-VIREO (Vireolanius melitophrys) – A large and beautiful vireo we enjoyed on Cerro San Felipe. 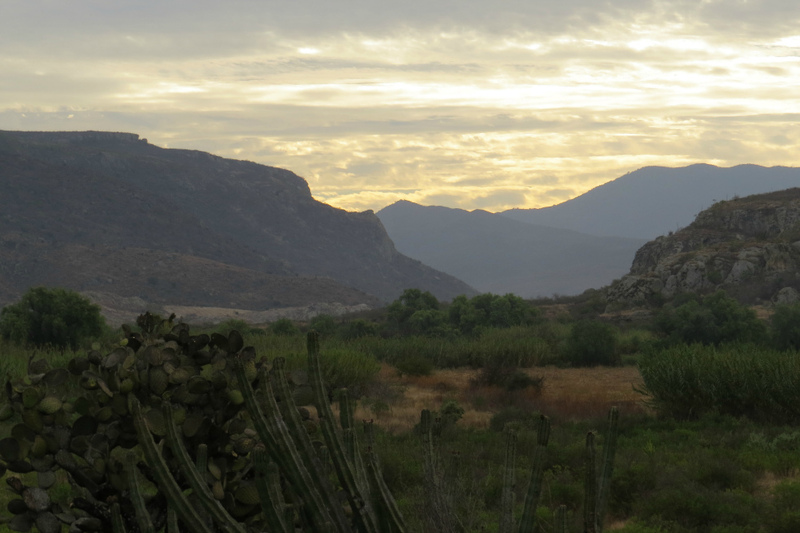 The oak-covered hills above the town of Teotitlan del Valle are home to several of Oaxaca's specialties -- including Ocellated Thrasher and Bridled and Oaxaca sparrows -- as well as Lesser Roadrunner. Photo by participant Alan Abel. WHITE-THROATED MAGPIE-JAY (Calocitta formosa) – Thanks to Mildred for getting us on a flock of four birds at KM 77! STELLER'S JAY (CENTRAL AMERICAN) (Cyanocitta stelleri coronata) – One of the main flock leaders in the pine-oak forest. WESTERN SCRUB-JAY (SUMICHRAST'S) (Aphelocoma californica sumichrasti) – So additional splits are on the table for Western Scrub-Jay, and if they pass, this might become a Mexican endemic: Sumichrast's Jay. COMMON RAVEN (Corvus corax) – The southernmost of the crows in the Americas, it reaches Nicaragua. VIOLET-GREEN SWALLOW (Tachycineta thalassina) – A huge horde of these lovely swallows swarmed over Piedra Azul our first morning! MEXICAN CHICKADEE (Poecile sclateri) – Well named, these are a high elevation forest species that we saw on Cerro San Felipe. BRIDLED TITMOUSE (Baeolophus wollweberi) – Two brief encounters above Teotitlan. 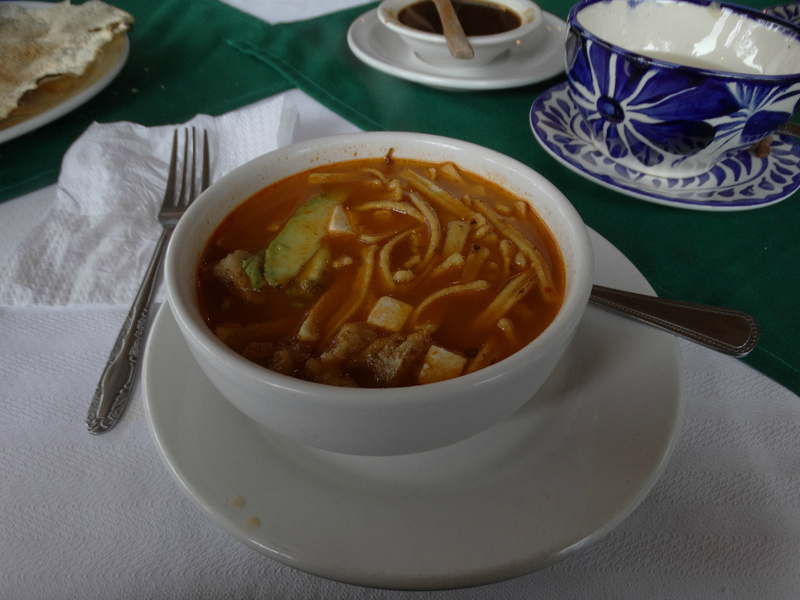 A delicious bowl of Aztec Soup helps warm us up after a cold morning on the mountain! Photo by guide Dan Lane. BUSHTIT (BLACK-EARED) (Psaltriparus minimus melanotis) – A flock at Santa Catarina de Ixtepeji allowed us to see the black ears of the males. BROWN CREEPER (ALBESCENS/ALTICOLA) (Certhia americana alticola) – Fairly common in the pine-dominated forests at higher elevations. ROCK WREN (Salpinctes obsoletus) – Several birds showed off at Monte Alban. HOUSE WREN (BROWN-THROATED) (Troglodytes aedon brunneicollis) – A bird kept hopping back up on the same stump repeatedly at Cerro San Felipe. Even though we were wearing coats against the cold, we were regularly reminded that we were indeed in the tropics! Photo by guide Dan Lane. BANDED WREN (Thryophilus pleurostictus) – A bit of a surprise was a bird that came in readily to scold tape with some fluff in its bill. Nest building? GRAY-BREASTED WOOD-WREN (CENTRAL AMERICAN) (Henicorhina leucophrys festiva) – We were lucky to find one, much less one that responded well enough to hop onto the side of the road at Cerro San Felipe! WHITE-LORED GNATCATCHER (Polioptila albiloris) – Typically found in lower elevation Pacific slope woodland, we saw several at KM 77. 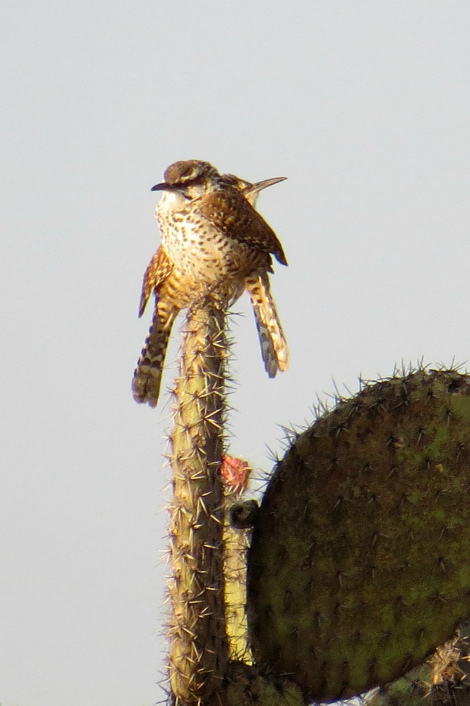 Boucard's Wren are the Oaxacan version of Cactus Wren, with the comparable habit of nesting in dense, thorny cactus clusters. Photo by participant Alan Abel. BROWN-BACKED SOLITAIRE (Myadestes occidentalis) – One of the best songsters in the world, in my opinion! CLAY-COLORED THRUSH (Turdus grayi) – This species was unknown from Oaxaca city prior to the 1980s, and was likely introduced. AMERICAN ROBIN (Turdus migratorius) – By the southern terminus of its range here in Oaxaca, American Robins are in high elevation forests only. CURVE-BILLED THRASHER (CURVIROSTRE GROUP) (Toxostoma curvirostre curvirostre) – It took a while, but eventually we saw it well. NORTHERN MOCKINGBIRD (Mimus polyglottos) – Near the southern terminus of its range. It is replaced in the lowlands by Tropical Mockingbird. GRAY SILKY-FLYCATCHER (Ptiliogonys cinereus) – We encountered small numbers most days, but at "Pollo Nino" we saw a flock of over a hundred! OLIVE WARBLER (Peucedramus taeniatus) – No longer a parulid (American Wood Warbler), this species is now in its own family. Although very similarly colored to the Chestnut-capped Brushfinch, this Collared Towhee is nevertheless a rather different bird behaviorally, and difficult to mistake. Photo by guide Dan Lane. CRESCENT-CHESTED WARBLER (Oreothlypis superciliosa) – After a few hard-to-see individuals in flocks, everyone got on a few above Teotitlan. Rufous-capped Warblers were common in dense, brushy areas. Photo by participant Alan Abel. 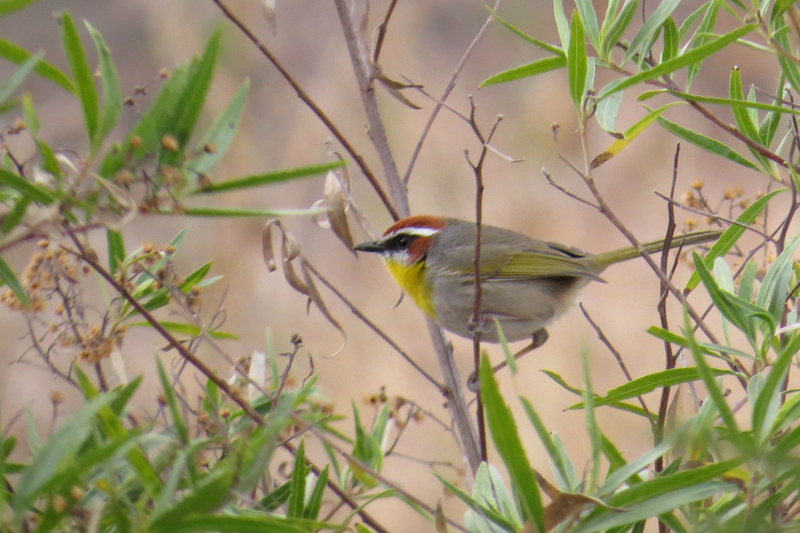 RUFOUS-CAPPED WARBLER (RUFIFRONS GROUP) (Basileuterus rufifrons rufifrons) – Common in dense brush at many sites. GOLDEN-BROWED WARBLER (Basileuterus belli) – A really handsome warbler we saw along a humid, brushy creek on Cerro San Felipe. PAINTED REDSTART (Myioborus pictus) – A familiar bird to folks who have been to SE Arizona. SLATE-THROATED REDSTART (Myioborus miniatus miniatus) – Similar to the last, but lacking the white wing patch and with a chestnut crown. One particularly extroverted individual flashed around in front of us near Santa Catarina de Ixtepeji. CINNAMON-BELLIED FLOWERPIERCER (Diglossa baritula baritula) – The northernmost of this strange group of tanagers, we saw a pair on Cerro San Felipe and another male on the Yuvila side. Among the most difficult of the Oaxacan endemics to see in the winter, Oaxaca Sparrows usually stick to dense brush. This one was rather an extrovert, however. Photo by guide Dan Lane. 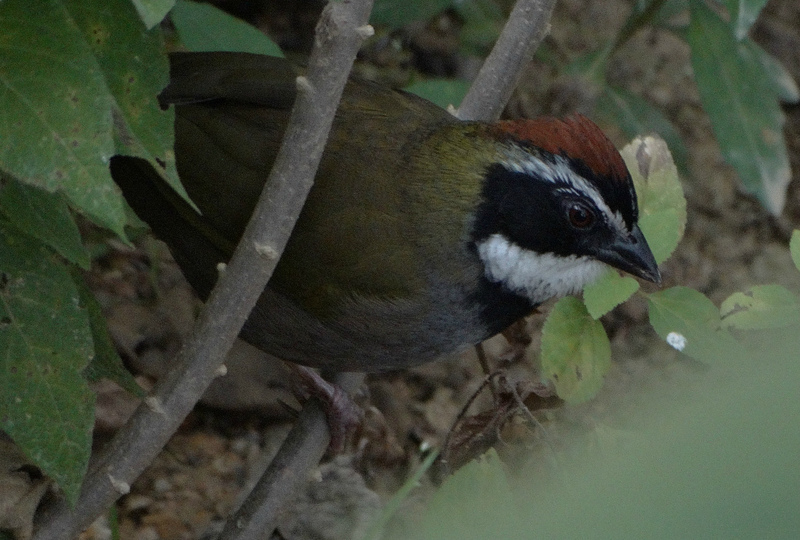 CHESTNUT-CAPPED BRUSHFINCH (CHESTNUT-CAPPED) (Arremon brunneinucha suttoni) – A towhee-like finch we saw along brushy creeks in the pine-oak zone. YELLOW-EYED JUNCO (Junco phaeonotus) – Around openings at the highest elevations. 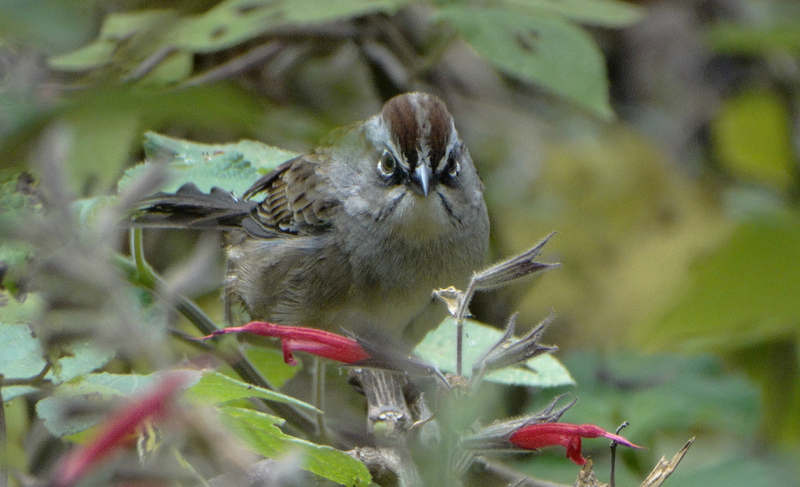 RUFOUS-CROWNED SPARROW (Aimophila ruficeps) – Similar to the next species, but without the blackish face. 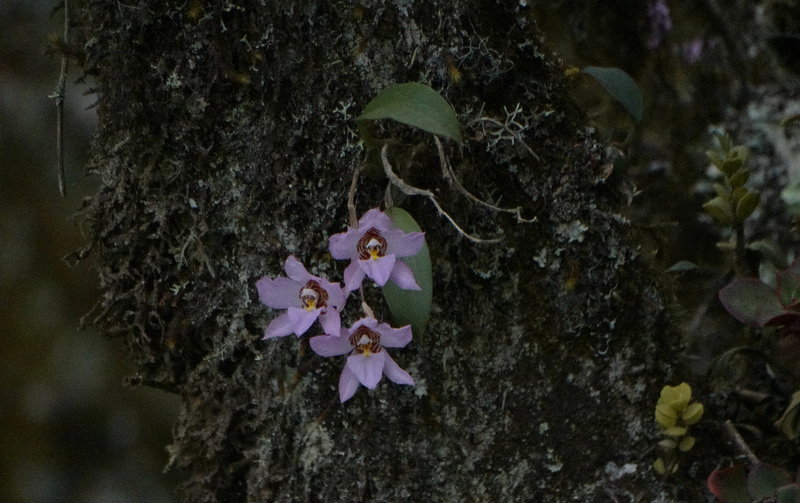 We saw a pair in the oak zone above Teotitlan. The colorful Orange-breasted Bunting was a big hit on the tour! Photo by guide Dan Lane. SPOTTED TOWHEE (MACULATUS GROUP) (Pipilo maculatus oaxacae) – Mostly heard, but a few popped up for a brief view. ORANGE-BREASTED BUNTING (Passerina leclancherii) – One of the favorites of the tour, we saw a fine male at KM 77. VARIED BUNTING (Passerina versicolor) – Three females were skulky the day we went to KM 77. GREAT-TAILED GRACKLE (Quiscalus mexicanus) – Mostly in the city. BRONZED COWBIRD (Molothrus aeneus) – Right around the hotel. BLACK-VENTED ORIOLE (Icterus wagleri) – An attractive oriole that we saw feeding at flowering trees. STREAK-BACKED ORIOLE (Icterus pustulatus) – Rare in the valley, we first had one at Yagul, then several more at KM 77. 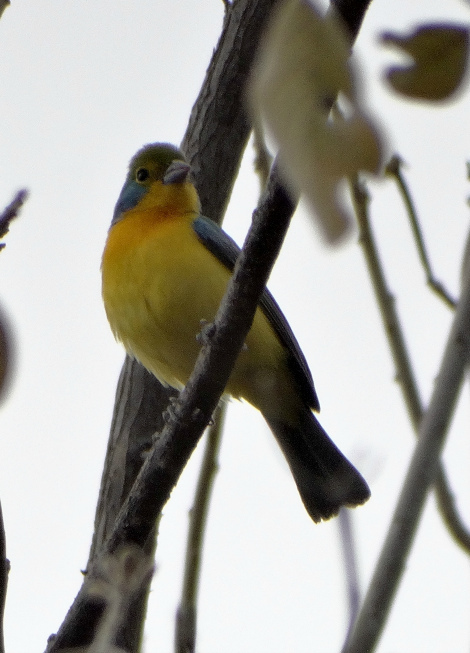 ELEGANT EUPHONIA (Euphonia elegantissima) – Fairly common this trip at most elevations. HOUSE FINCH (COMMON) (Haemorhous mexicanus roseipectus) – Common in the floor of the valley, but its stark red and brown plumage might throw you if you think it'll look like most back home. Wow! Extended views of this Jaguarundi were certainly unexpected! This cat is one of the the Neotropic's more poorly-known mammals. Photo by guide Dan Lane. EASTERN COTTONTAIL (Sylvilagus floridanus) – One bounced across the path behind the Ovenbird. MEXICAN GRAY SQUIRREL (Sciurus aureogaster) – Common at the hotel, where some had rufous bellies and others had pale bellies. We saw a few in more 'natural' settings, as well. HISPID COTTON RAT (Sigmodon hispidus) – A sneaky rat in the fields at Yagul. JAGUARUNDI (Puma yagouaroundi) – Wow! Perhaps the bird of the trip! This cat wasn't too quick in crossing the road above Piedra Azul for us to notice it, and about 20 min later it crossed the creek and up the other bank... giving us a fine show!